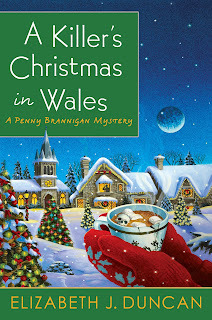 Victoria Hopkirk from the Penny Brannigan mysteries by Elizabeth J. Duncan. But I wish she'd spend more time on our business and less time running about all over the countryside solving mysteries. That's what the police are for, and not only that, her gentleman friend is a police officer. Let him get on with it, is what I say. Penny just can't seem to help herself. And here's old muggins, me, going along with it, enabling her. I look after the business, listen while she discusses her theories on who did it over a nice cup of tea and a scone, act as her sounding board, try to make helpful suggestions and just generally be supportive. Do I get any credit for all this? No. These books are all about Penny and her sleuthing skills. But I don't really mind. When you think about it, the sleuth's assistant has an important role to play. She provides the literary foil, can be a catalyst, asks the right questions (What are you going to wear?) and often holds the final piece of the puzzle. Of course sometimes the sidekick just makes the tea. But there are perks. In the new book being written now, the author wanted me out of the way for a few weeks so she very kindly sent me to Tuscany to take a cooking course. I stayed in a charming pensione and almost had an affair with a married man. I'd love to tell you all about that but I've just remembered. It's not about me. Tuscany works! Maybe you should start a list of places you'd like to go, and there could be a travel book of your own in this--without the messy bodies. OMGosh, I am in looooove with both the book cover and that glorious photo of the tea cups and plates of sweeties. But back to topic... there is nothing wrong with being the sidekick... sometimes they get the best lines! Sidekicks are indispensable and look at the travel points you can wrack up. Sounds like a great life -- a spa & travel. Enjoy! I'm glad you have the Tuscany trip coming up, Victoria. You seemed a bit exasperated with Penny during her most-recent caper, much more so than during the first one. I think you could use a vacation. And a little dalliance might be nice, too, but do try to avoid married men - you just don't seem the type. Have fun in Tuscany, Victoria. You need a break. Your expanded business has taken a toll, so say nothing of those murders. Remember, Penny has made a difference. Looking forward to seeing both of you soon. Wow, perhaps you can convince that author of yours that you deserve a story, too. Your pictures are making me hungry. I'm off to grab a snack. I look forward to reading more about your adventures! Thank you everyone for your kind words. I am back from Tuscany now and working undercover at Ty Brith Hall. It was Penny's idea. She promised her detective she wouldn't get involved in this murder investigation but didn't say anything about me. Heh Heh. oh Victoria, I want to hear more about this almost-affair.